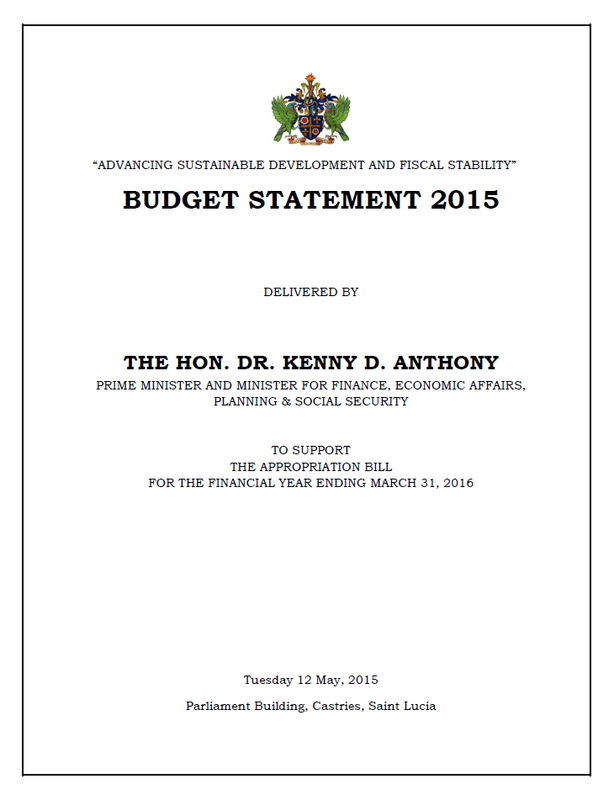 2015-2016 Budget Statement 2015: Advancing Sustainable Development and Fiscal Stability. Delivered by The Honourable Dr. Kenny Davis Anthony, Prime Minister & Minister For Finance, Economic Affairs, Plannning, & Social Security. 12 May 2015. 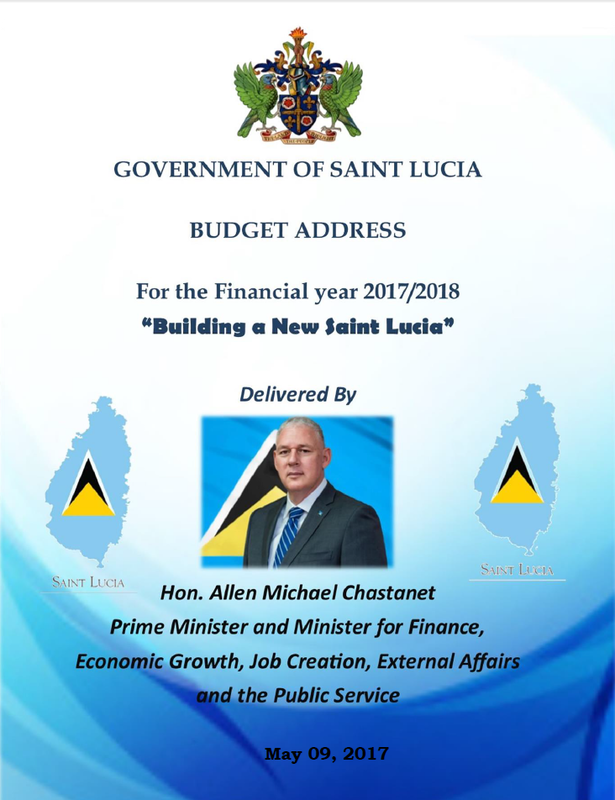 2014-2015 Budget Statement for the Financial Year 2014-2015: Building the Pillars for Economic Success, Resilience, and Fiscal Stability. Delivered by The Honourable Dr. Kenny Davis Anthony, Prime Minister & Minister For Finance, Economic Affairs, Plannning, & Social Security. 13 May 2014. 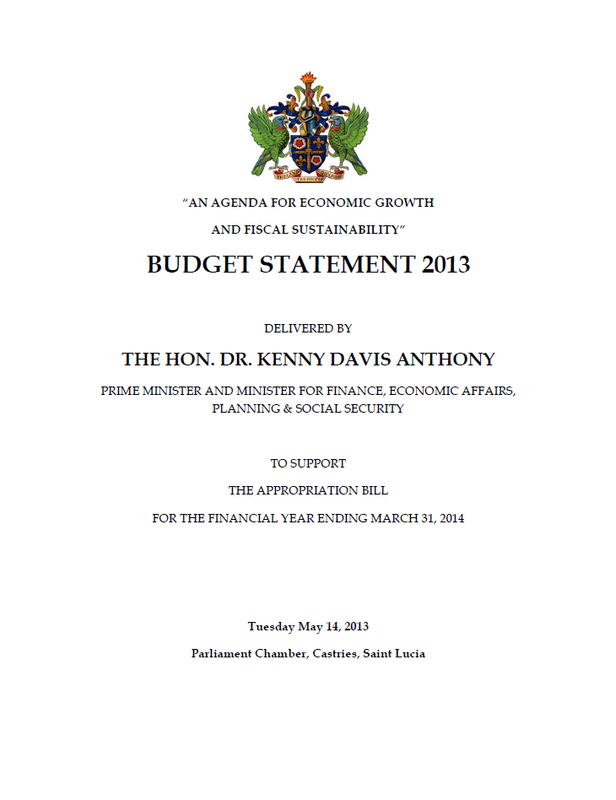 2013-2014 Budget Statement for the Financial Year 2013-2014: An Agenda for Economic Growth and Fiscal Sustainability. Delivered by The Honourable Dr. Kenny Davis Anthony, Prime Minister & Minister For Finance, Economic Affairs, Plannning, & Social Security. 14 May 2013. 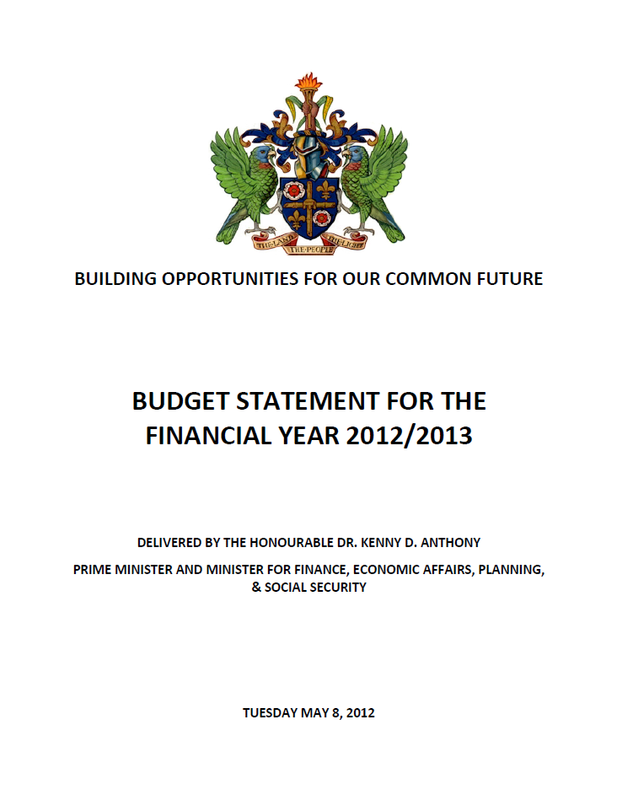 2012-2013 Budget Statement for the Financial Year 2012-2013: Building Opportunities for Our Common Future. Delivered by The Honourable Dr. Kenny D. Anthony, Prime Minister & Minister For Finance, Economic Affairs, Plannning, & Social Security. 8 May 2012. 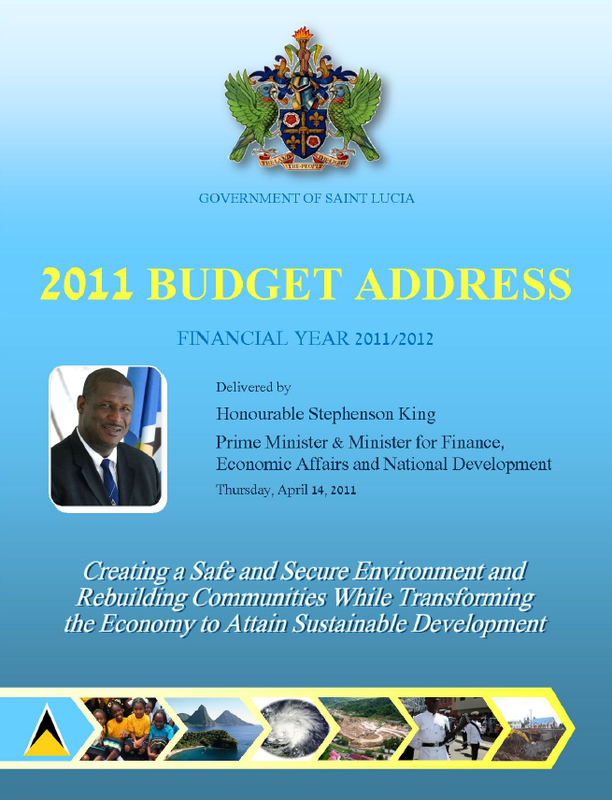 2011-2012 Budget Address for the Financial Year 2011-2012: Creating a Safe and Secure Environment and Rebuilding Communities While Transforming the Economy to Attain Sustainable Development. Delivered by The Honourable Stephenson King, Prime Minister & Minister For Finance, Economic Affairs, and National Development. 14 April 2011. 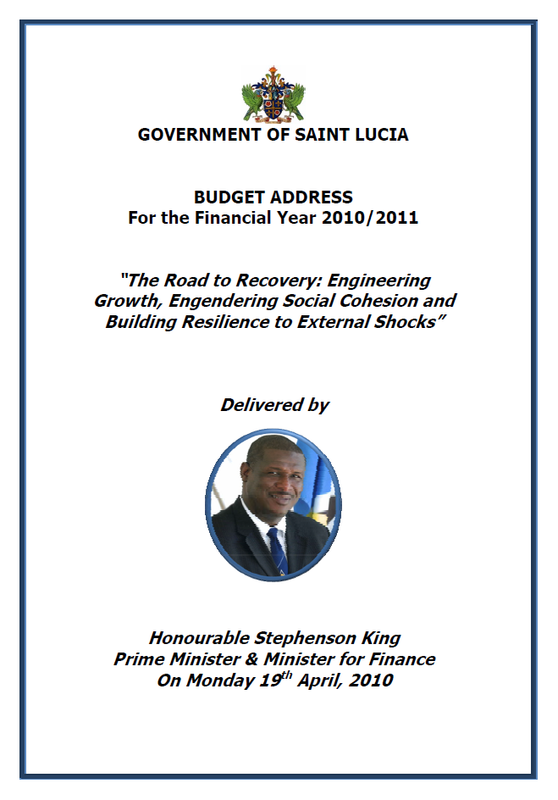 2010-2011 Budget Address for the Financial Year 2010-2011: The Road to Recovery: Engineering Growth, Engendering Social Cohesion and Building Resilience to External Shocks. Delivered by The Honourable Stephenson King, Prime Minister & Minister For Finance. 19 April 2010. 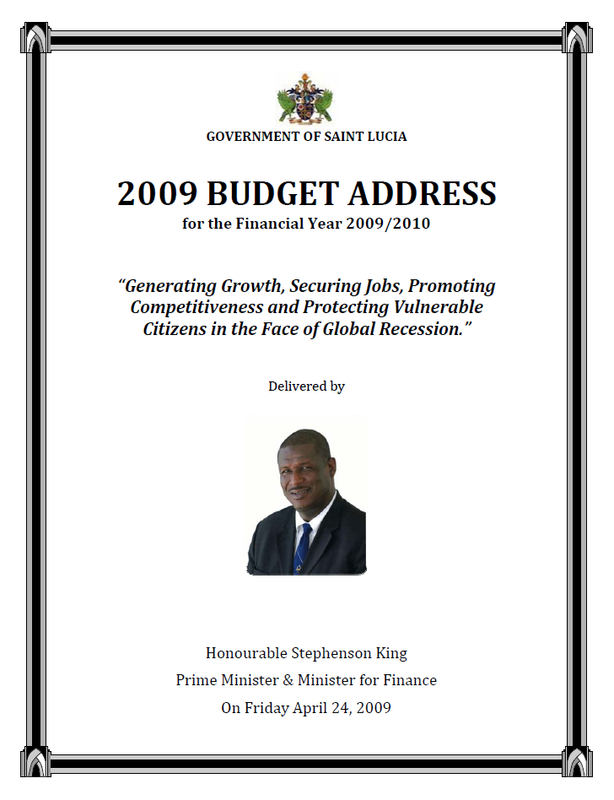 2009-2010 Budget Address for the Financial Year 2009-2010: Generating Growth, Securing Jobs, Promoting Competitiveness and Protecting Vulnerable Citizens in the Face of Global Recession. Delivered by The Honourable Stephenson King, Prime Minister & Minister For Finance. 24 April 2009. Rallying Our People for Development in an Era of Global Opportunities and Challenges. 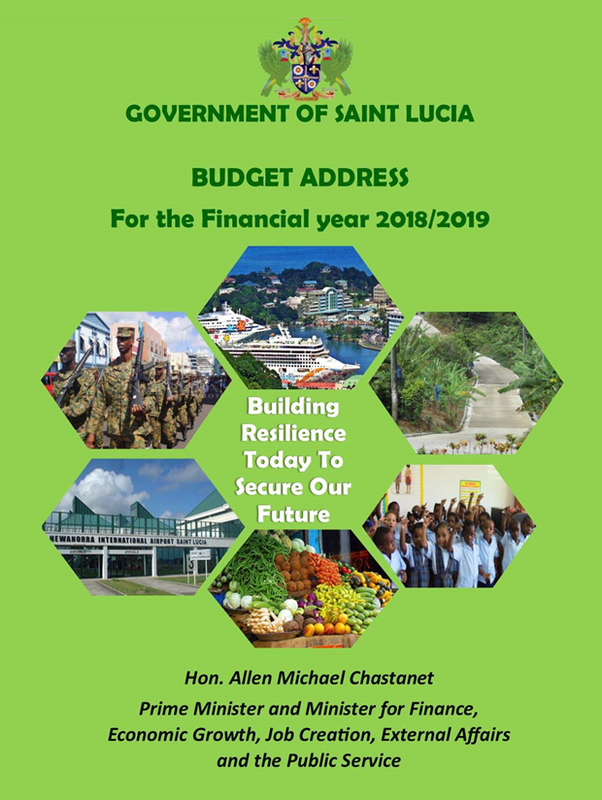 Delivered by The Honourable Stephenson King, Prime Minister And Minister For Finance. 21 April 2008. 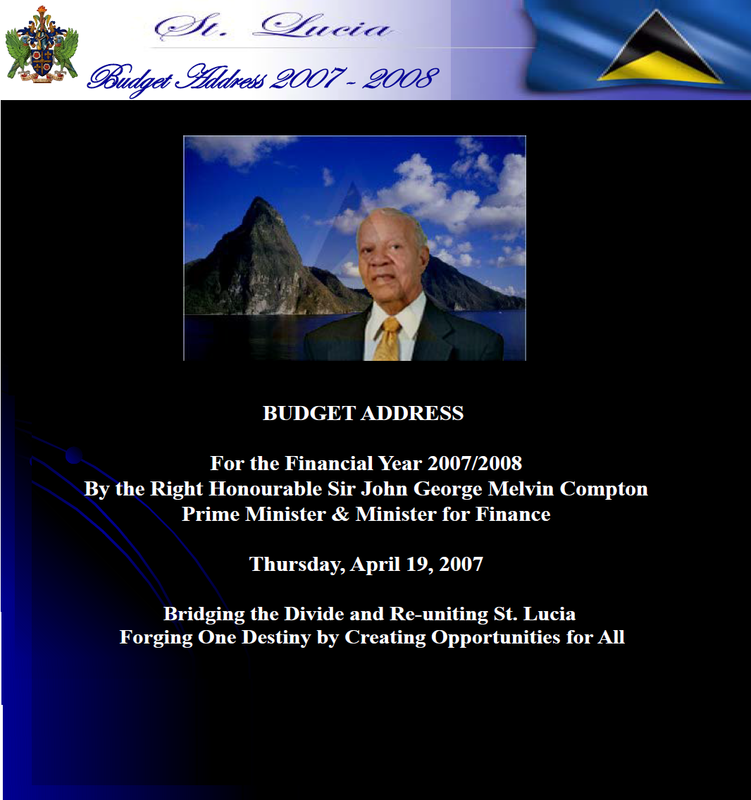 2007-2008 Budget Address for the Financial Year 2007-2008: Bridging the Divide and Re-Uniting St. Lucia Forging One Destiny By Creating Opportunities for All. Delivered by The Right Honourable Sir John George Melvin Compton, Prime Minister & Minister for Finance. 19 April 2007. Economic Affairs, International Financial Services and Information. 25 April, 2006. 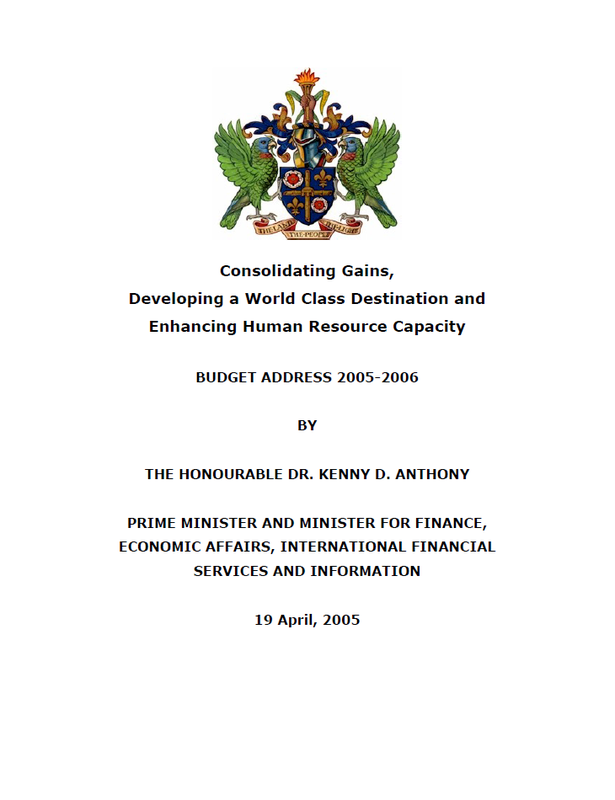 2005-2006 Budget Address 2005-2006: Consolidating Gains, Developing a World Class Destination and Enhancing Human Resource Capacity. Delivered by The Honourable Dr. Kenny D. Anthony, Prime Minister and Minister for Finance, Economic Affairs, International Financial Services and Information. 19 April, 2005. 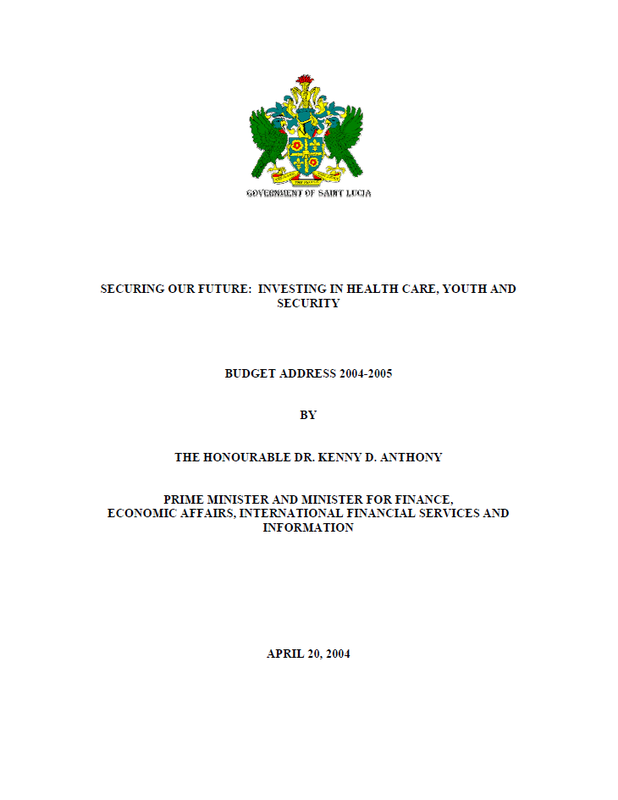 2004-2005 Budget Address 2004-2005: Securing Our Future: Investing In Health Care, Youth and Security. Delivered by The Honourable Dr. Kenny D. Anthony, Prime Minister and Minister for Finance, Economic Affairs, International Financial Services and Information. 20 April 2004. 2003-2004 Budget Address 2003-2004: Advancing Infrastructural Development And Economic Recovery in an Uncertain World. 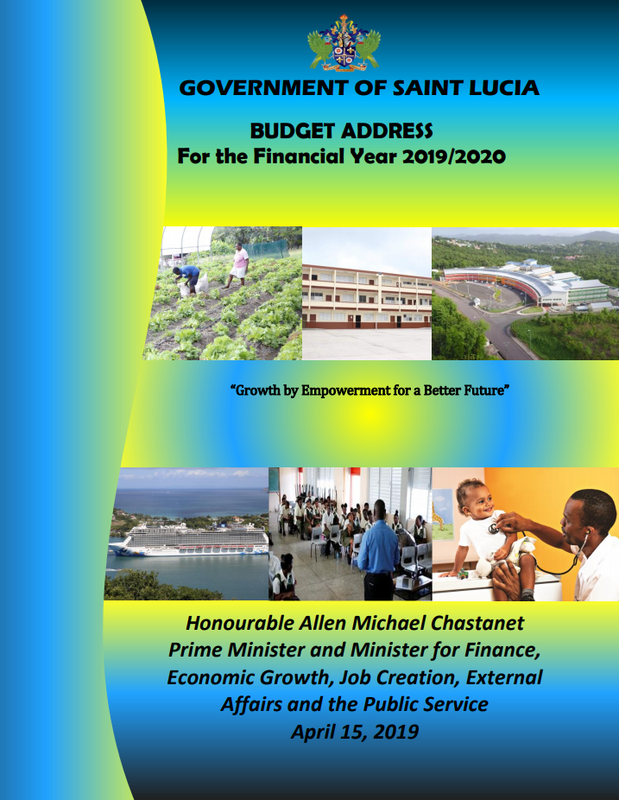 Delivered by The Honourable Dr. Kenny D. Anthony Prime Minister and Minister for Finance, Economic Affairs, International Financial Services and Information. 8 April 2003. 2002-2003 Budget Address 2002-2003: Enhancing Investment, Revitalising Agriculture and Stimulating Recovery. Delivered by The Honourable Dr. Kenny D. Anthony, Prime Minister and Minister for Finance, Economic Affairs, International Financial Services and Information. 30 April 2002. 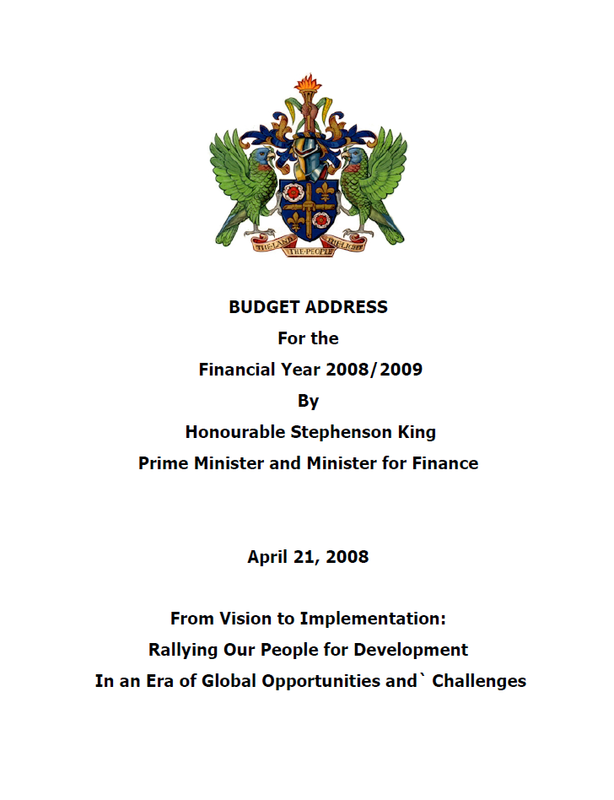 2001-2002 Budget Address 2001-2002: Inspiring And Sustaining Development in a Changing World. Delivered by The Honourable Dr. Kenny D. Anthony, Prime Minister and Minister for Finance, Economic Affairs, International Financial Services and Information. 5 April 2001. 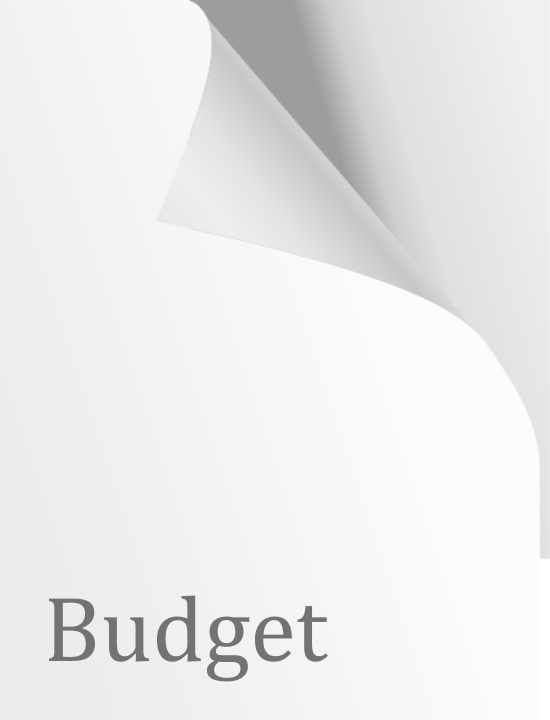 2000-2001 Budget Address 2000-2001: Strengthening, Modernising and Repositioning The Economy. 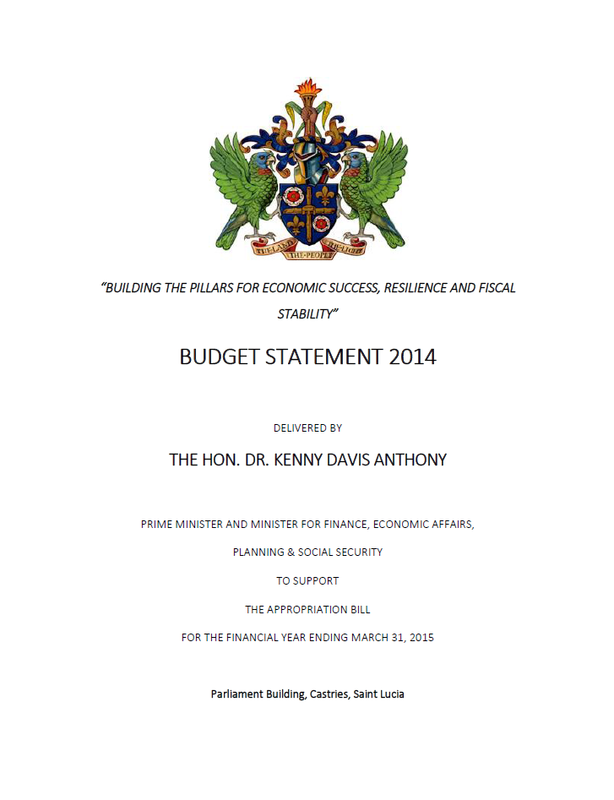 Delivered by The Honourable Dr. Kenny D. Anthony Prime Minister and Minister for Finance, Economic Affairs and Information. 28 March 2000.
and Social Recovery. Delivered by Dr. The Hon. Kenny D. Anthony, Prime Minister and Minister for Finance, Planning & Sustainable Development, Information Services & the Public Service. 23 March 1999. 1998-1999 Budget Address 1998-1999: Stimulating and Re-Orienting The Economy Towards Sustained Growth. Delivered by Dr. The Hon. 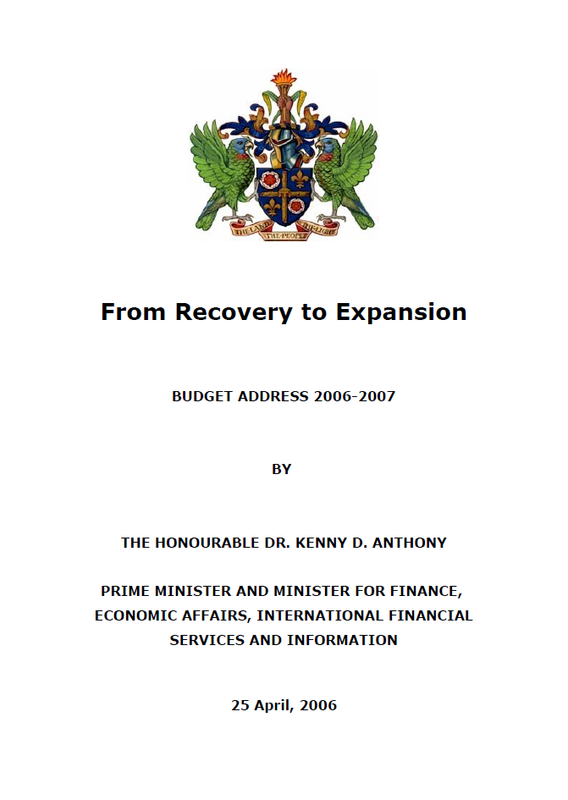 Kenny D. Anthony, Prime Minister and Minister for Finance. 21 April 1998.